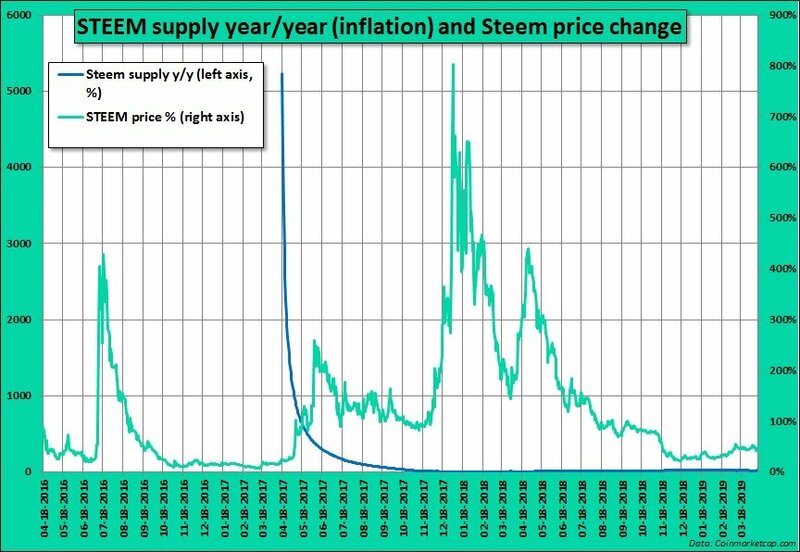 From The Beginning Of Steem Times – Did Steem Inflation Push Down The Price? That supply growth is called inflation in the crypto-space. Purely theoretically, if no other condition changes, 20 percent more of any goods or assets, with the same unchanged demand, could mean a 20 percent lower price. But as I wrote, in reality, the price of some cryptocurrencies with high inflation was increasing, and some with low inflation fell a lot in 365 days. There doesn’t seem to exist any real correlation – at least, not in the last 12 months. Is moderate inflation O. K.? November 27, 2016, the “Hard Fork 16” put the new inflation rules in function (9.5 percent p. a., and slowly decreasing, by approximately 0.5 percent every year). The inflation slowed down considerably, although, it often stepped over 9.5 percent p. a. since then. The price reached new lows in next year (7,2 cents in March 2017), but the fall was no more so strong as in 2016. Since December 2016, I see no more clear correlation between the Steem emission and the market price. At least, looking at these graphs. I think, the chart is telling us that moderate and predictable inflation can be tolerated by the market, it should not inevitably influence the prices. Or if it is influencing, only in a small extent which you can’t detect clearly (unambiguously). Prices itself are too volatile to measure the factors behind. 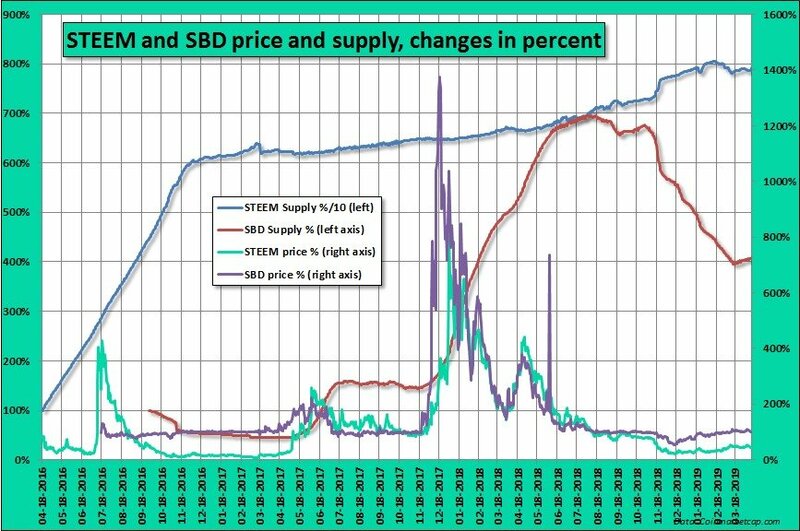 The Steem and SBD prices of the end of 2017 and beginning of 2018, in the “big hype” show us that in a similar hype everything is possible. Totally regardless of supply, the prices exploded like hell. There was a smaller, but very similar shaped explosion on the chart in Summer of 2016. It seems to be that in a hype, people buy all coins, in a crash, they sell all coins. It’s not always necessary search for rational or logical reasons, the behavior of the crowd can be totally irrational. Some Steemians are blaming the SBD/Steem conversions for the fall of Steem last year, and looking to the chart, that correlation seems to be possible. As the supply of SBD (red line on the first chart) surged from the end of 2017 until approximately the October 2018, Steem price was moving in a downwards path. In the last 5-6 months, SBD supply is decreasing and Steem recovered, stabilized. But due the fact that SBD market capitalization (total value) is 9.2 million dollars and Steem capitalization 133 millions, I suppose, SBD/Steem conversions are also only one part of the story. Aren’t explaining all the price moves, in my humble opinion based on common sense. The really important question could be if we can attract more Steem buyers, newcomers to Steem world, or not. Buyers can generate 1-2 orders of magnitude (10x, 100x) more price changes than the actual, moderate supply growth. As we saw it the in golden age, in the boom of 2017/2018.